When a restaurateur or grocer invites you to purchase their food, they are making an implicit promise that the food is safe for consumption. It is the responsibility of everyone involved in the production, handling, transportation, preparation, and service of the food to do everything reasonable to ensure the safety of the food you eat. Unfortunately, sometimes these professionals do not live up to their promise. Sometimes, either through negligence or in a deliberate attempt to cut corners, dangerous contamination occurs and you or a loved one has suffered serious food poisoning. It can be difficult, if not impossible, for you as an individual to determine the source of your food poisoning. Because of the complicated food supply chain and the length of time before sickness occurs, it often takes many people reporting their illness to identify the culprits. Your report may be the missing piece of information necessary to identify and stop a dangerous contamination before more people are seriously hurt or killed. When you contact the Rubinstein Law Group about your food poisoning in Oceanside, San Marcos, Carlsbad, Escondido, or other parts of Southern California, our personal injury lawyers in Escondido can not only discuss your legal options, but how to properly report your illness to help track down the source. The globalization of the food production industry has dramatically increased the potential reach of food contamination incidents. To a great extent, food is safer than ever. Food-borne illnesses like trichinosis and salmonella are significantly less common than they were in the early days of the food packing industry, but as the industry has become increasingly integrated on a global scale, when contamination occurs, it can be hard to discover its scope and source. Consider the 2008 recalls of tomatoes and jalapeños. Although the tomatoes were recalled, the Food and Drug Administration (FDA) was never able to identify the source of salmonella poisoning, nor did it know why jalapeños were contaminated or where they had been shipped. And consider the recall of peanut butter in 2009, which focused not on jars of peanut butter, but on processed foods containing peanut butter, a list that grew daily to include over 2100 products in 17 categories, including ice creams, pet foods, and pre-packaged meals, many of which you might never suspect contained peanut butter at all. The contamination resulted in at least nine deaths and over 600 cases of reported food poisoning in 44 states. Get medical help immediately. The sooner you get treatment for your food poisoning, the better your chances for a quick and full recovery. Put together a list of foods you have eaten during the incubation period of your food-borne organism. Once you have been diagnosed, you can then determine what time period to focus on, which can be as long as three weeks. It is helpful to assemble receipts that identify when and where food was purchased. Contact a law firm experienced in handling cases of food contamination. If you have suffered serious pain, illness, and incurred medical expenses due to the negligence or misconduct of a corporation, you deserve compensation. 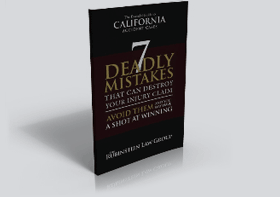 The personal injury attorneys in Vista at the Rubinstein Law Group have led the way in helping Californians who have been the victims of food poisoning. We have a successful track record and can put our experience to work for you to find out who is responsible for your food poisoning. We will aggressively pursue just compensation you are entitled to for your injuries. To learn more about pursuing a food poisoning lawsuit, please contact the Rubinstein Law Group today. We represent clients in Oceanside and surrounding areas of San Marcos, Escondido, Carlsbad, and Vista, but if you need us, we can come to you.